A great home features flexible interior design. This means that different rooms in the house are designed in different ways to create different feelings. Don’t get me wrong, the overall interior design theme of the home should be consistent to the point where rooms don’t completely juxtapose one another. For example, if you have a modern kitchen, you should back it up with a modern bathroom and general modern design trends throughout the home. But, there are ways in which you can subtly change the design of certain rooms to create certain atmospheres – all while following your core interior design theme. Today, we’re looking at how you can create a relaxing space in your home. Relaxation is an important part of life, and we should aim to try and relax as much as possible while in the house. There are many different ways in which you can add a relaxing space to your home; it can be part of your bedroom, it can be your living area, or it could even be a separate room altogether for people to chill in. When you’re designing a space like this, then furniture becomes exceedingly important. In fact, it should be right at the top of your priority list. The furniture matters because the whole point of this area is relaxation. Therefore, you need to get your hands on furniture that helps you relax and creates a more relaxed atmosphere. So, what furniture fits this description? To start, you can immediately discount certain types of furniture that just don’t suit this atmosphere at all. Things like dining room tables, wooden chairs, metal chairs, and pretty much anything else that’s quite robust and hard. Instead, turn your attention to items that are a lot softer and more comfortable. 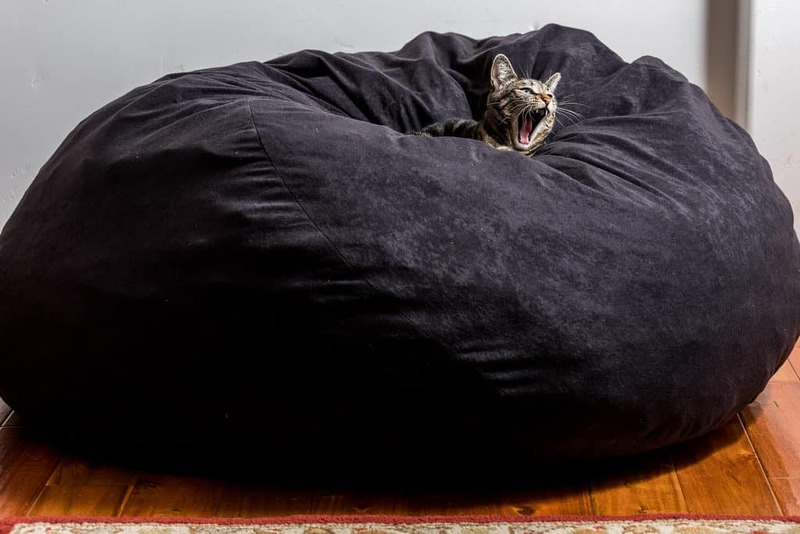 As it shows on Fombag.com, you can get some big bean bag chairs that are ideal for relaxed spaces. With a bean bag, you have something that you can lie on and really just sink into while you relax. The same goes for some big and comfy armchairs as well; they’re very easy for you to sit in, and it feels like you almost can’t get up because they’re so comfortable. Also, think about footstools/pouffes as well. They help you relax and rest your legs when you’re sitting on an armchair or sofa. Another idea is a reclining chair – or maybe even a massage chair if you want to take things to the next level! The bottom line is that the furniture forms a very important design element of a relaxing space in your home. If you get your choices right, you’ll have an area of your home that’s designed to help you relax and feel incredibly comfortable. Just having the furniture in that space can exude feelings of relaxation and calmness. As well as the furniture, you need to think about the lighting in a relaxing space as well. This is another key design element as it helps set the tone and mood of the room. Lighting is such a good way of giving off certain atmospheric feelings and themes. Bright lights make a place feel very alive and vibrant, dark lights create a more intense and closed-in atmosphere. So, how do you find the perfect balance and ensure that your relaxing space has the perfect lighting for you? Personally, my favorite idea is to use dimmer switches in the room in question. This is perfect if your living space is part of a bigger room – like your bedroom or living area. When you want to sit and relax in your comfy furniture, you can turn down the intensity of the lighting to create a softer, more relaxing, glow. Then, if you’re using the room for other purposes, you can turn the light up to create a different type of atmosphere. There’s a really good article on dummies.com that tells you how to replace your light switch with a dimmer switch. This is perfect for anyone that’s never done it before and wants to save money on electrical work. I’ll also add that lamps and candles are a fantastic way of adding to the mood in your relaxing space. Not only do they help create the soft lighting you’re looking for, but they also serve as excellent accessories for the room too. You can match the candles/lamps to fit the design of the area, so everything matches and looks fantastic. The main thing to remember is that you need to give the lighting some serious thought when designing a relaxing space. The flooring is also very important if you’re trying to design a nice relaxing space in your home. Certain types of flooring don’t really exude comfort and relaxation. Again, this is quite similar to furniture in that you want to avoid things that are quite hard and firm. If you’re designing an entire room that’s going to become a relaxing space, then I’d avoid things like hardwood and laminate flooring. Instead, carpet is definitely your best bet. Understandably, some of you may be designing a relaxation area that’s just part of a wider room – as we’ve already mentioned. So, what can you do if the flooring in that room is already laminate, hardwood, or any other ‘firm’ type? It’s simple; get some rugs! Rugs serve as mini versions of carpet to help bring that comfortable feeling to otherwise uncomfortable places. There’s an article on apartmenttherapy.com that tells you how to choose the right rug, and this could be worth reading if you’re stuck and don’t know where to begin. Your main concern should be that the rug is nice and thick, which helps make the area more cosy and comfortable. Think about it for a second, are you more comfortable and relaxed with carpet underfoot or hard flooring? Most people will say carpet because it’s soft and you could even lie down on it. So, try and get carpeted flooring if possible. If you can’t, then get a rug or two instead to create a similar effect in your relaxing space. Naturally, the way you organize an area will always play a big role in how good it looks. When you’re trying to create a relaxing space, then you have to be very careful not to make it too crowded or too spacious. If you overcrowd the area with a lot of furniture that’s bunched together, then it starts to feel too cramped and claustrophobic. You need to have some room to breathe, otherwise, you’ll never be able to fully relax in this area. Having said that, you can’t let there be too much open space in this little area either. This is why a lot of people just create relaxing areas of bigger rooms so it can be a nice small section of a room that’s different to the rest of it. If you tried making a massive room into a relaxing area, then it just wouldn’t work because there’s just too much space. You don’t want everything to be spaced out as it creates a distant feeling in the area. It should be nice and closed in but within reason. Realistically, this is probably the hardest aspect of designing a relaxing area in your home. You have to strike the right balance between allowing yourself room to breathe and not being too open. It may take some time to perfect but just play around with how you organize the furniture and other elements of this space. In general, you shouldn’t have a great deal of stuff in a relaxing space. Some people can make do with just one piece of furniture to chill on, some like to have a couple – it’s up to you. Remember, the whole purpose is to just lie there and relax while reading a book or listening to some music. There doesn’t need to be a lot going on, or this will just overcomplicate things and force you to feel too crowded or too spaced out. So, to conclude, there are a few key things to consider when designing a relaxing space in your home. Regardless of where this space will be, you need to put the furniture at the forefront of your plans. With the right furniture, you instantly create the right atmosphere. Then, give consideration to the lighting in this little area too; it should help build the right mood for you to feel relaxed. After this, you think about the flooring; make sure you have something soft underfoot to help you feel nice and comfortable. Finally, you should organize the space, so you don’t feel too cramped, but at the same time, you don’t have a massive open space. Get all of this right, and you’ll design the perfect little relaxation space in your home.